G'day! 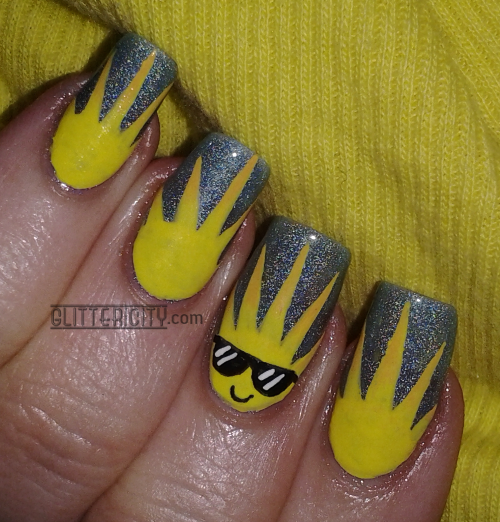 Today's manicure is for day 3 of the challenge: inspired by the colour yellow! I started with a nice sky blue holo: Absolute by Nubar. It's beautiful, but very sheer. I like the look for the purpose of this design, but normally I would layer this over a creme in a similar colour. This is five coats--FIVE!-- and there's still some nail line showing. I know, I know... but once I got started painting layers, I was kinda committed. 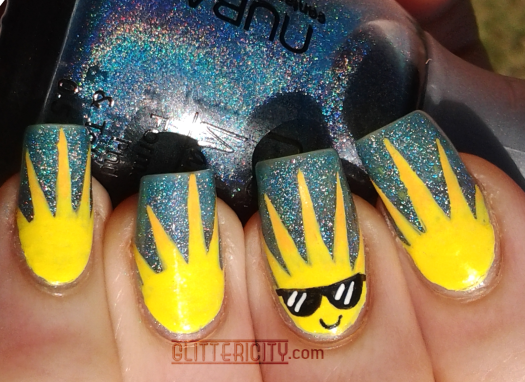 Anyway, it sort of works for this one since most of the nail line is covered by the suns. Topped with two coats of Seche Vite. I'm still wearing these, and they make me smile each time I look at them! They're some of the happiest nails I've ever had.